Your pay stub shows gross wages, your W-2 shows taxable wages. 2. Are SSI Benefits Affected by Unemployment Earnings? 3. What Is Unearned Income When It Comes to Taxes? Your gross income is all the receipts you receive in the form of money, property, goods and services. Gross income can include earned income and unearned income. Both forms of income added up equal your gross income. As an employee, you receive wages or salary. Your gross wages include all the compensation you get from your employer before mandatory and voluntary deductions are taken out. This includes straight-time earnings, salary, tips and by-the-job or piece-rate pay. 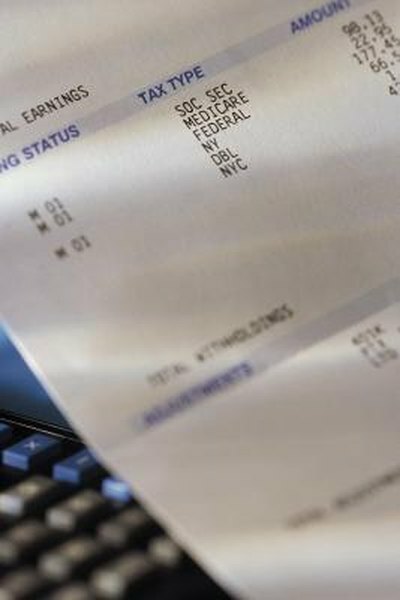 Supplemental wages are not regular wages, but they are included in gross pay. Such wages can include overtime pay, commissions, bonuses, severance pay, awards, back pay, prizes, fringe benefits, retroactive pay increases, accrued sick leave, moving expense payments and business expense reimbursements. If your employer pays you non-cash wages such as clothing, lodging, goods or food, include the fair market value of those items in your gross wages. As a self-employed person, your gross income is your total revenue minus your gross profit or cost of goods sold. You track your business’s revenue and expenses on an income statement, which can be monthly, quarterly or yearly. The statement shows all of your income and expenses that resulted in your current profit or loss. As an employee or a self-employed person, you might receive income that is not derived from earned sources. This includes annuities, private pensions, inheritances, gifts, interest and dividend payments, asset profits, rents, farm income, royalties, support and alimony payments and gambling winnings. Additional sources includes Social Security payments, retirement fund earnings, workers’ compensation, unemployment compensation, federal fund payments, in-kind payments such as food and shelter, and death benefits such as life insurance proceeds. Unless an IRS-approved exception applies, canceled debts are also part of your gross income. As an employee, your allowances and pretax deductions reduce your tax withholding. As a self-employed person, your qualified deductions lower your tax liability. IRS: Topic 431 -- Canceled Debt –- Is It Taxable or Not?